46 / the tasting panel / march 2017 T here's a stretch of beach in Encinitas, California, separated from Highway 101 by a low-set, rocky perimeter. Cruising down the coast, you'll notice teetering pillars of rocks sprouting up from this jag- ged barrier as if Mother Nature had haphazardly and unsuccessfully tried to build a gray picket fence. This was not built by Mother Nature, however; it was created by practiced stone stackers. Doing so does require a bit of skill, but the real purpose is to harness the mental clarity achieved through patience, concentration and balance. The art of stone stacking is likely rooted in Japanese Buddhism. It is said that perhaps the very first stupas (shrines) were simply stacked stones, honoring intention rather than ornament. Regardless of cultural background, the Zen of the simple act can be beneficial for all. It's good for your soul and mind, just like eating well and exercising are good for your body. These things, of course, are very important to a lot of people. 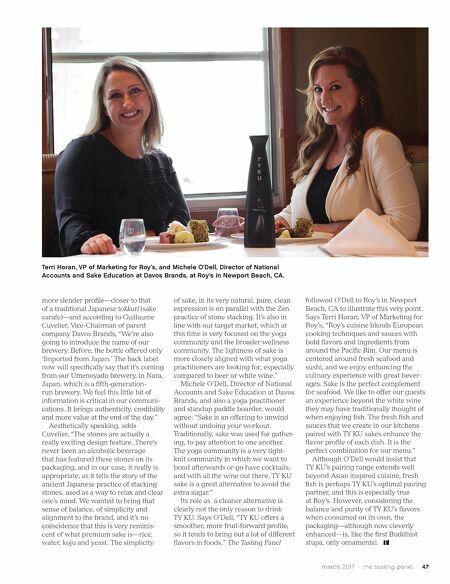 In fact, consumer trends in health and wellness continue to increase, and the master- minds behind TY KU Sake, a premium, innovative sake brand, know this better than anyone. The increase in the wellness sector could also be the reason the market for sake continues to grow. It's certainly one impetus for the recent evolution in the TY KU's non-traditional packaging. 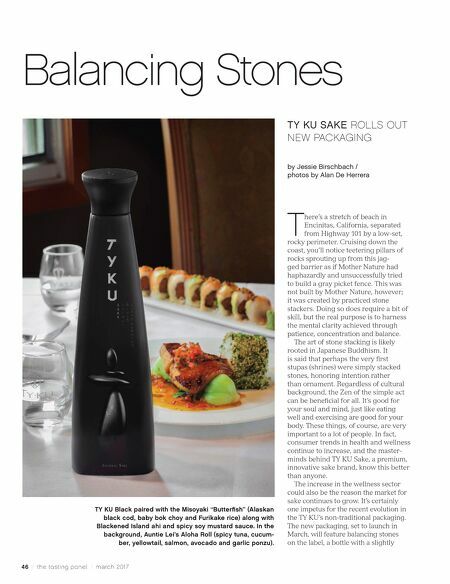 The new packaging, set to launch in March, will feature balancing stones on the label, a bottle with a slightly Balancing Stones TY KU SAKE ROLLS OUT NEW PACKAGING by Jessie Birschbach / photos by Alan De Herrera TY KU Black paired with the Misoyaki "Butterfish" (Alaskan black cod, baby bok choy and Furikake rice) along with Blackened Island ahi and spicy soy mustard sauce. In the background, Auntie Lei's Aloha Roll (spicy tuna, cucum- ber, yellowtail, salmon, avocado and garlic ponzu).